Investors around the world need to calm down. That's the message from European Central Bank president Mario Draghi to close out a turbulent week. Stock markets in Europe, the U.S. and Asia tumbled Thursday after the ECB decided to pump more stimulus into the economy, but not as much as predicted. "It was not a package meant to address market expectations," Draghi told the Economic Club of New York on Friday. The Dow lost over 250 points Thursday and the euro surged against the dollar. It was the total opposite of what many traders and strategists anticipated would happen. 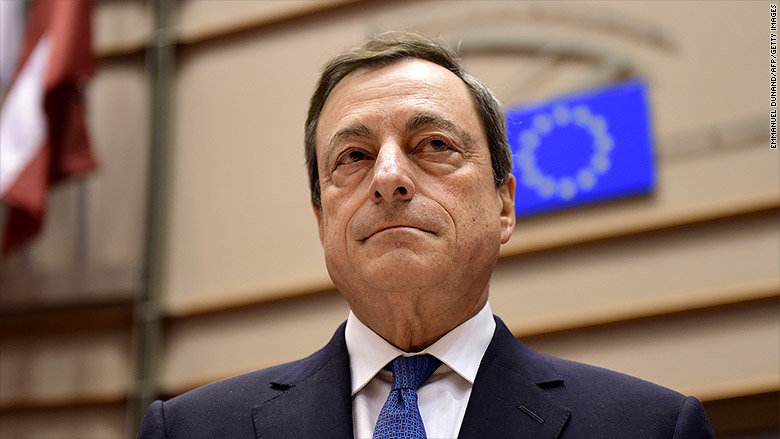 Draghi says the reaction was overblown, especially the assertion that there is a lot of dissent on the ECB policy making committee. He stresses the latest decision was approved by a "very large majority." The ECB is also united in its readiness to do more stimulus if necessary. "We have the power to act. We have the determination to act. We have the commitment to act," Draghi said. There are "no limits" to how far the ECB will go to deploy its various tools. "The bottom line of what I'm saying is QE is here to stay," Dragh said Friday, referring to the economic boost known as quantitative easing. Stock markets were already recovering Friday. The Dow surged over 300 points after a report came out showing very strong American job gains in November. America's central bank is widely expected to raise interest rates later this month. That will put the U.S. and Europe on very different economic paths. Europe's central bank is doing all it can to spur economic growth by keeping interest rates low. Draghi said the ECB's stimulus efforts are necessary -- and already having an effect. He claims economic growth will be roughly 1% higher in the next two years because of the QE program. Even more importantly, Draghi believes Europe no longer has to fear deflation, a drag that has hurt Japan. "The risk of deflation in the monetary area is firmly off the table," Draghi said, emphasizing the word "firmly."